Who doesn’t love bagels? But, are they fancy enough to serve on Valentine’s Day? 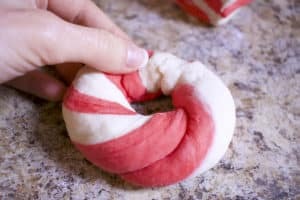 We’ve come up with a unique homemade bagel recipe that is perfect for a special breakfast in bed or a busy, grab-and-go treat. How did we do it? While we are not the first to come up with the idea, we simply couldn’t resist making our own version for Valentine’s Day this year. If you want to try this one at home, we’ve put together a step by step tutorial with photos to help! This one is sure to impress your sweetheart. The flavors and toppings are very customizable to fit anyone’s tastes! First, start by proving the instant or active dry yeast. Not every recipe calls for adding a sweetener to the water, but I always do. I think it helps give the little yeasts something to eat to help them grow. The water should be between 110 and 130 degrees F. Any cooler and your yeast may not activate. Any warmer and the yeast could die. While the yeast is blooming, measure out your dry ingredients. 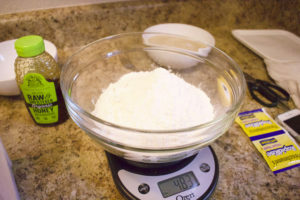 I like to bake using weight measurements, but you can use whatever method you like best. Add the yeast mixture and flour mixture into the bowl of a stand mixer fitted with a dough hook attachment. 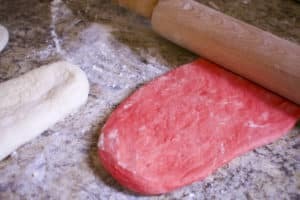 Allow to mix until the dough looks something like this. Now it’s time for the fun coloring! 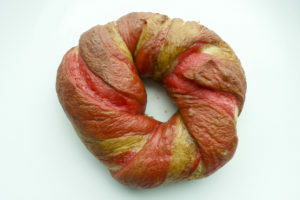 If you want the entire bagel to be pink, add the coloring in to all the dough. If you would like to do a swirl, like we did, only cover half. 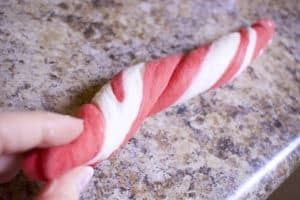 I divided the dough so that there would be a little more red dough than white. Also, I ended up adding in some red because it just wasn’t PINK enough for me. But feel free to add as much or as little coloring as you like! Once everything is well combined, place in greased, glass bowls to rise. If you are wanting to make a savory bagel, I recommend using olive oil. If you would like to make a sweet bagel, try butter or coconut oil. Let them sit for 1 hour. After an hour, the dough should look like this! Turn the dough out onto a floured surface and kneed until the dough is no longer sticky and has a smooth surface. Cut into sections! I made three hot pink and two white. This is why I divided the dough unevenly during the coloring step. Roll out the colors into about 6 inch long rectangles. And then stack them on top of one another, like this! Make cross-section cuts perpendicular to the long side. You should have enough for 8 slices. 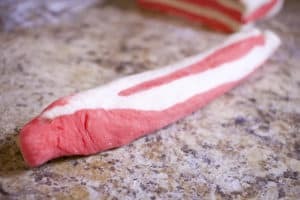 Take these slices and roll them into long strips. Once formed, place these on a baking sheet lined with a silicone mat, parchment paper, or even some cornmeal, if you’re going for something more savory. Let them rest for about 20 minutes while you get the next step ready. Also, if you want to make these ahead of time and prepare them fresh the next day, this is where you want to stop. Cover the bagels with plastic wrap and store in the refrigerator until you’re ready to make. 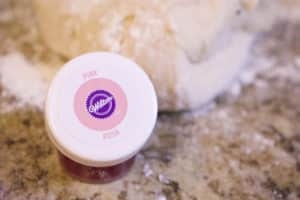 There are lots of bakers that recommend doing this anyway to develop the flavors! But, we don’t want to wait for bagels today, so let’s keep going! You know that yummy, chewy crust on the outside of the bagel we all love so much? That comes from boiling the bagels right before baking. Add some water, honey, and baking soda to a pot and bring to a full boil. You can add as many bagels to the pot at a time as you can fit. 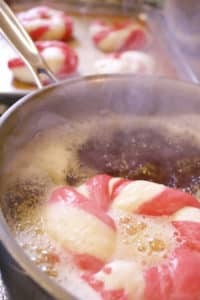 However, they should stay on the surface of the liquid and the water should stay at a rolling boil through the process. Now it’s time for toppings! This is where you can get as creative as you like! I chose sweet toppings, like these white nonpareils and sugar crystals, but if you’re going for a savory bagel, flaked garlic, sesame seeds, or black poppy seeds would all look amazing on these! And here they are finished! I covered my bagels with a aluminum foil tent to prevent too much browning. I wanted to see the pink coloring after baking. Just look at that cross-section! What’s not to love about these! In a small bowl, mix the warm water and honey until well combined. Add yeast and set aside for 5 minutes, or until the yeast blooms. In a larger bowl, combine the flour, sugar, and salt. Set aside. 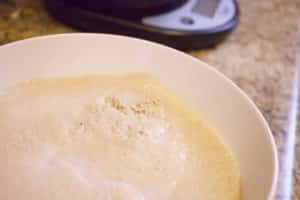 Once the yeast has bloomed, add the yeast mixture and the flour mixture to the bowl of a stand mixer. Turn the machine on low and mix using the dough hook attachment. Mix for 5 minutes. The dough should be well combined and smooth. 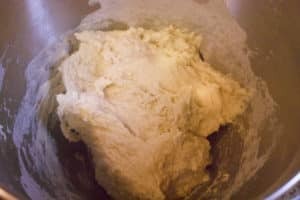 Turn the dough out into a floured surface. Divide the dough in two parts. Kneed the first section until smooth and no longer sticky. Place one in a greased bowl and cover with plastic. 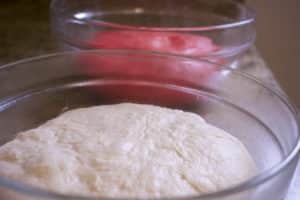 Return the other half of the dough to the stand mixer and add the pink or red food coloring. Allow the dough to mix until well combined. Once done, turn out the dough onto a floured surface and kneed until the color is completely homogenous. 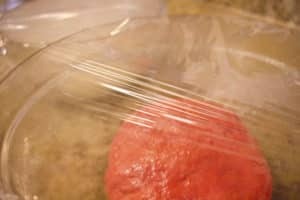 Place this colored dough into another greased bowl and cover with plastic. Allow to rise for 1 hour. After an hour, turn the dough out onto a floured surface and kneed until the dough is smooth and no longer sticky. 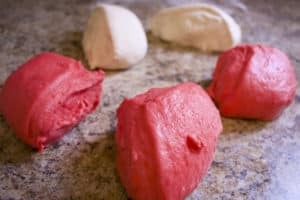 Divide the pink dough into 3 equal parts and the white dough into 2 equal parts. Roll each dough ball into 6 inch long rectangles. 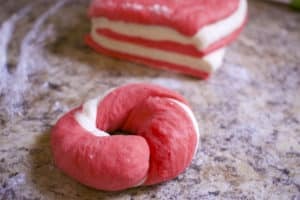 Starting with pink, stack them one on top of the other (pink dough, white, dough, etc). 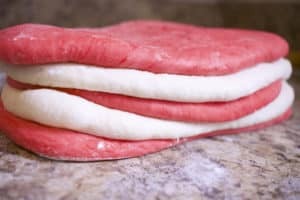 Slice dough into 8 slices. Take each slice and roll it into a long rope. 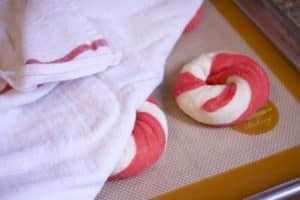 Twist the dough and then loop it around, joining the two ends to make the bagel shape. Place onto a baking sheet lined with parchment paper or a silicone mat. Cover with a towel and set aside to rise about 20 minutes. While the bagels rest, fill a pot with the water, honey, and baking soda. Allow to come to a rolling boil. Once boiling, add bagels one or two at a time to the water. Allow to boil for 30 seconds on each side. Remove and place back onto the baking sheet. Repeat until all bagels are done. 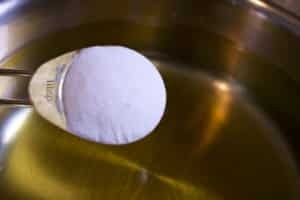 In a small bowl, mix together egg white and water to make a wash. 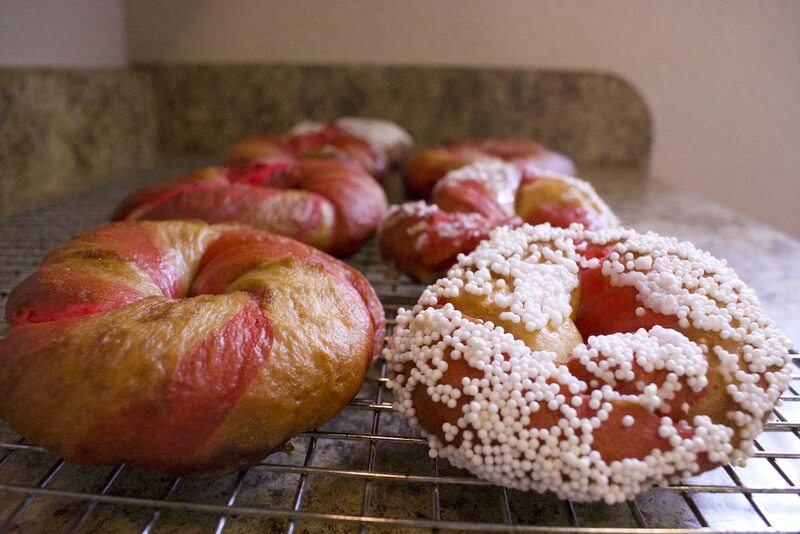 Paint onto the tops of the bagels. Add toppings of your choice. Cover the bagels with aluminum foil and place into the oven. Allow to bake for 25-35 minutes, or until the bagels are nice a tough on the outside, but still soft to the touch. 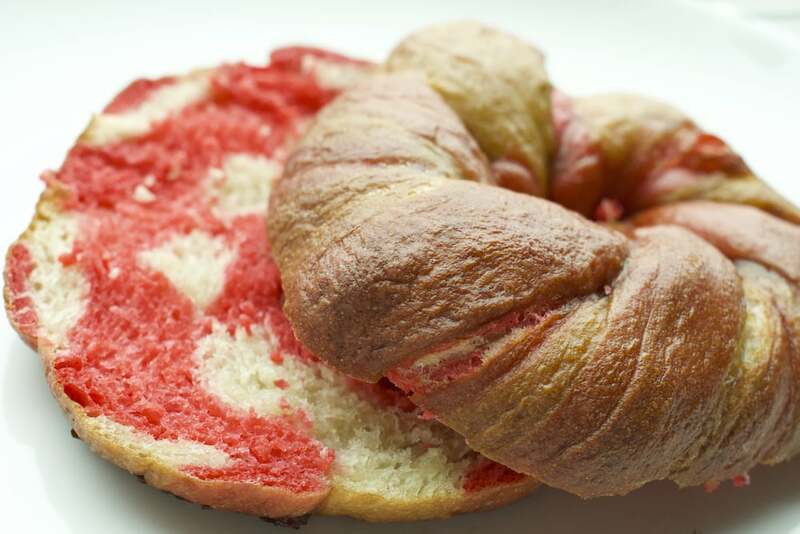 Do you think you’ll try these pink bagels this Valentine’s Day? What toppings would you add? 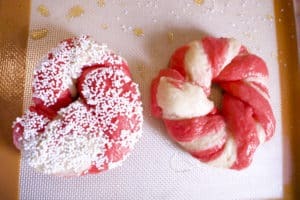 This entry was posted in Food, Holidays and tagged bagel recipe, bed and breakfast, breakfast, pink, recipe, Valentine's Day by joy. Bookmark the permalink.